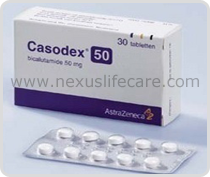 Uses:- Casodex Tablets is used to treat prostate cancer that has spread to other areas of the body. Casodex Tablets is used in combination with hormone treatment. Casodex Tablets works by blocking the action of male hormones in the prostate, slowing growth of the tumors. Side Effects:- Bloating or swelling of the face arms, hands lower legs or feet, blood in the urine, body aches, cough or hoarseness, fever of chills , headache, nervousness.